HEINZ Ranch Dressing is a rich, creamy dressing made with buttermilk and fresh sour cream. Onions, garlic, parsley, and chives add both flavor and visual appeal to this dressing. The 12 gram packets are a great option for consumers looking to take their favorite flavor on the go. 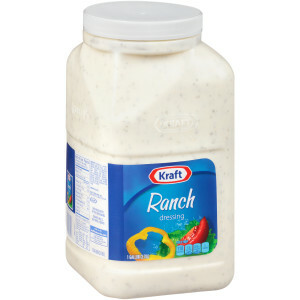 KRAFT Ranch is a rich, creamy traditional favorite with a nice blend of herbs and buttermilk to provide a well balanced dressing. 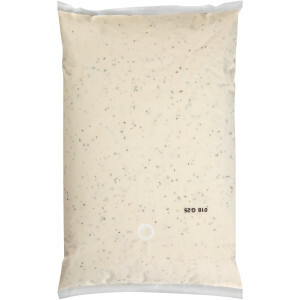 Satisfy everyone with this classic favorite, in convenient packaging at a great value! 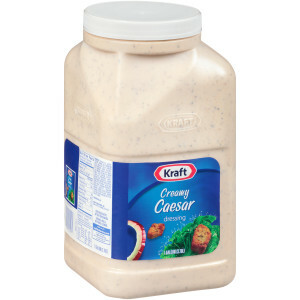 KRAFT Creamy Caesar has a classic Caesar flavor with aged Romano and Parmesan cheeses and a special blend of spices. 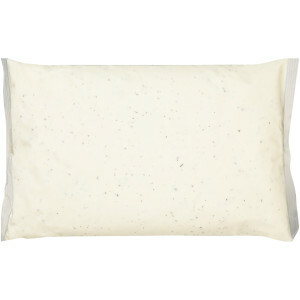 The creamy consistency makes a great salad dressing or sauce on any entrée. 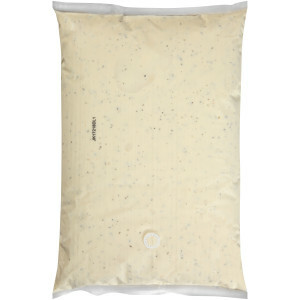 The one gallon jug makes it easy to use this dressing as either an ingredient or a topping. 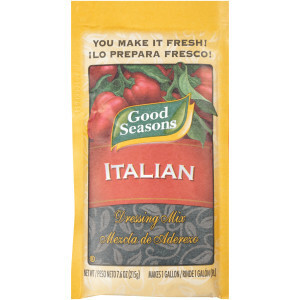 This GOOD SEASONS Dry Italian Salad Dressing Mix provides a fresh Italian taste that can't be found in prepared dressings. 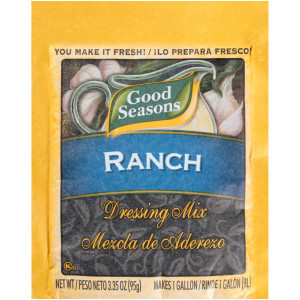 This dressing has an artfully crafted blend of herbs and spices that your patrons will love! Make the most of salads and more with GOOD SEASONS Dressings Mix. It's more than just a convenient way to make salad dressings with scratch-made taste. It’s a versatile ingredient that helps you create unique marinades, sauces, dips and more. 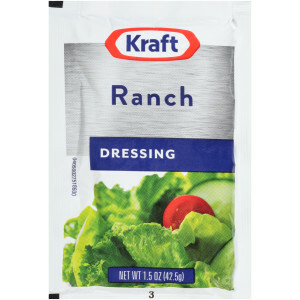 HEINZ LIGHT RANCH DRESSING gives customers the satisfaction of a rich, consistent ranch dressing with fewer calories. Its minimal packaging and reduced product waste make our dispenser format the profitable option for large-volume operations. 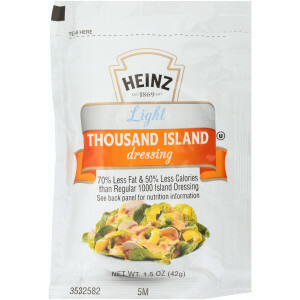 HEINZ Light Thousand Island Dressing is available on the go to use for your salads, sandwiches, or snacks. This dressing lets you enjoy the same great taste as the original, but with less fat and calories. These single serve packets are perfect for patrons who are looking for healthier options in their condiment station without sacrificing great taste. Made with fresh buttermilk for bold flavor, HEINZ Ranch Dressing is packaged to reduce product waste, making our dispenser format the profitable option for foodservice operations. 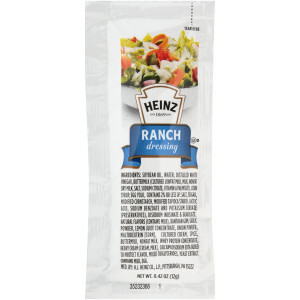 HEINZ Ranch goes great with most entrées and it is a crowd-favorite when it comes to condiments. Made with fresh buttermilk for bold flavor, HEINZ Ranch Dressing is packaged to reduce product waste, making our dispenser format the profitable option for large-volume operations. 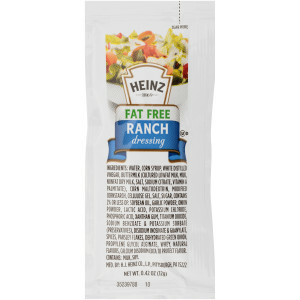 HEINZ Ranch goes great with most entrées and it is a crowd-favorite when it comes to condiments. 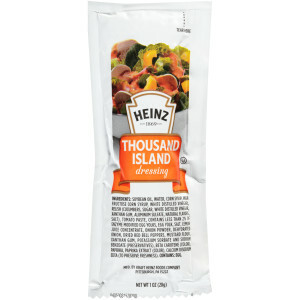 HEINZ Thousand Island Dressing is available on the go to use for your salads, sandwiches, or snacks. With a brand name people know and love, HEINZ is trusted to deliver top quality and taste to every dish! 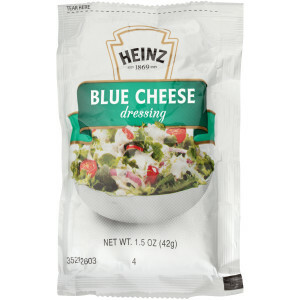 HEINZ Blue Cheese Dressing is available on the go to use for your salads, sandwiches, or snacks. With a brand name people know and love, HEINZ is trusted to deliver top quality and taste to every dish! 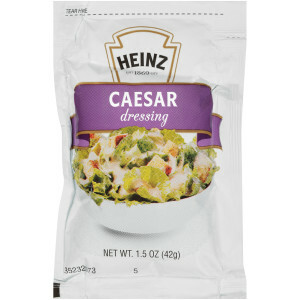 HEINZ Caesar Dressing is a must-have for salads and sandwiches, adding that popular flavor consumers want. The 1.5oz packet is a perfect size for consumers to take on the go to add to their meals. 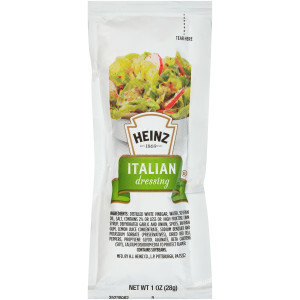 HEINZ Creamy Italian Dressing is perfect addition to any salad and great for vegetable dipping. It extra creamy with Italian spices and a hint of sour cream flavor. The 1oz packets are convenient to take on the go. 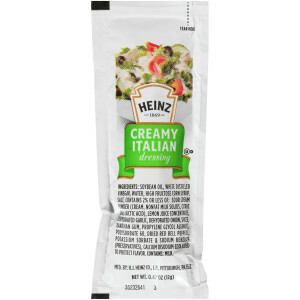 HEINZ Creamy Italian Dressing is perfect addition to any salad and great for vegetable dipping. It extra creamy with Italian spices and a hint of sour cream flavor. The 12 gram packets are convenient to take on the go. 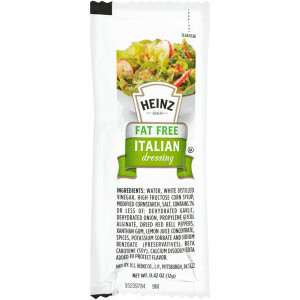 HEINZ Fat Free Italian Dressing is available on the go to use for your salads, sandwiches, or snacks. This dressing lets you enjoy the same creamy taste as the original Italian dressing, but with no fat! With a brand name people know and love, HEINZ is trusted to deliver great taste. Bring your salad or sandwich to life with HEINZ Fat Free Ranch Salad Dressing. With the same delicious taste of regular Ranch dressing, consumers can feel confident and healthy with this fat free option. The single serve packets are a great options for consumers on the go. 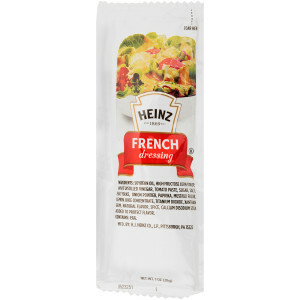 HEINZ French Dressing is a traditional French Dressing with the tangy flavor of tomato, garlic, and onion. 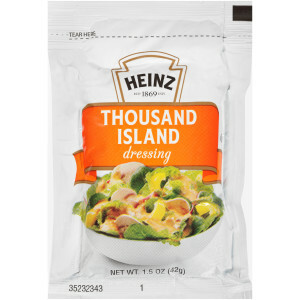 The 1oz packets are a great option for consumers looking to enjoy the French Dressing on the go for their favorite salads or sandwiches! 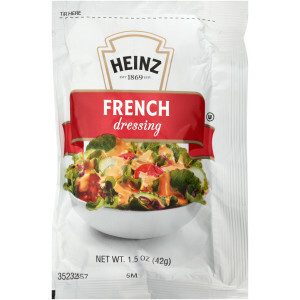 HEINZ French Dressing is a traditional French Dressing with the tangy flavor of tomato, garlic, and onion. The 1.5oz packets are a great option for consumers looking to enjoy the French Dressing on the go for their favorite salads or sandwiches! 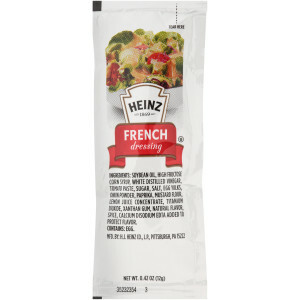 HEINZ French Dressing is a traditional French Dressing with the tangy flavor of tomato, garlic, and onion. The 12 gram packets are a great option for consumers looking to enjoy the French Dressing on the go for their salads and sandwiches, or to pour it on their favorite meal! 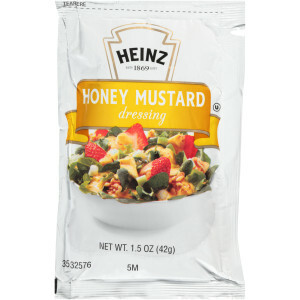 HEINZ Honey Mustard Dressing is the perfect balance between sweet and tangy to top any salad or be used to dip any snack. With a brand name people know and love, HEINZ is trusted to deliver top quality and taste to every dish! 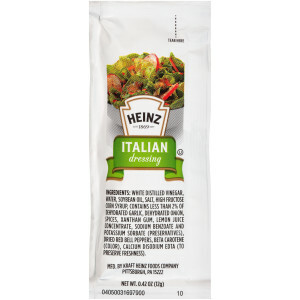 HEINZ Italian Dressing is a flavorful on the go topping for every snack and salad. This dressing has just the right combination of zest and spice in a 1.5oz packet- making it easy for customers to take their favorite flavor on the go! With a brand name people know and love, HEINZ is trusted to deliver top quality and taste to every dish. 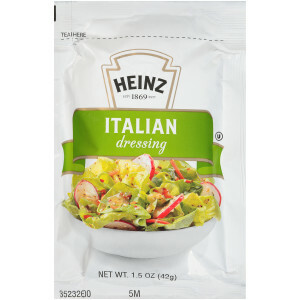 HEINZ Italian Dressing is a flavorful on the go topping for every snack and salad. With a brand name people know and love, HEINZ is trusted to deliver top quality and taste to every dish! HEINZ portion control products delivers great flavor without the hassle of large or messy containers. Take them on the go or for large events to make adding flavor to your meals easy. 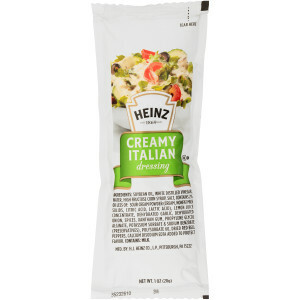 HEINZ Italian Dressing is a flavorful on the go topping for every snack and salad. This dressing has just the right combination of zest and spice in a 12 gram packet- making it easy for customers to take their favorite flavor on the go! With a brand name people know and love, HEINZ is trusted to deliver top quality and taste to every dish. 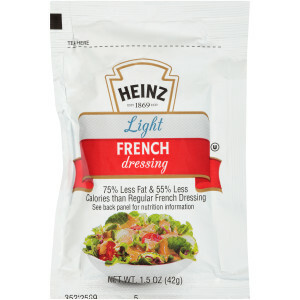 HEINZ Light French Dressing is available on the go to use for your salads, sandwiches, or snacks. This dressing let's you enjoy the same great taste as the original, but with less fat and calories. These single serve packets are perfect for patrons who are looking for healthier options in their condiment station without sacrificing great taste. 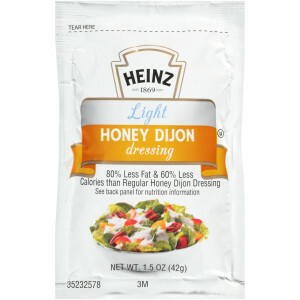 HEINZ Light Honey Dijon Dressing is available on the go to use for your salads, sandwiches, or snacks. This dressing let's you enjoy the same great taste as the original, but with less fat and calories. These single serve packets are perfect for patrons who are looking for healthier options in their condiment station without sacrificing great taste. 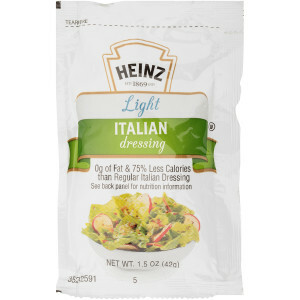 HEINZ Light Italian Dressing is available on the go to use for your salads, sandwiches, or snacks. This dressing let's you enjoy the same great taste as the original, but with less fat and calories. These single serve packets are perfect for patrons who are looking for healthier options in their condiment station without sacrificing great taste.